Last weekend in France, Essay track held CIK-FIA Karting Academy series first stage, which was attended by 51 participants including our driver Valters Zviedris. Last year Latvian champion in carting and title Annual Athlete Jurmala Technical sports - Valters Zviedris already has returned from France and are ready to attend in starts this weekend here at home, Latvia. With speeds displayed Valters team are satisfied, but with the end result no so much, because Valters didn’t get any point. It should be noticed that he points are given only for TOP 15 athletes from 51 contestants. Two training days - Thursday and Friday, Valters quickly being accustomed to the technique and regular presentation of results top 10-15 places. Friday was rainy and the results had been even better and at times even Valters held top spot 3-5. Qualification trip, which also took place in the rain Valters showed the best results of all 51 contenders, but given the fact that the first group was significantly slower then start both the Qualifying Race, Heat, or it gave only 15th place, because the riders were classified alternately from the two qualifying groups. First Heat (Group A to B), Valters got a good start and after the first lap he was 7th, but after the second 6th place. Then, during the race some places were lost and attain the finish was 10th place. The second qualifying run, half of the participants (group C) started with a completely new tires and, therefore, they were relatively difficult to pass on similar fight. At one point though Valters had taken 13th place, but then fallen to 18th place at the finish. These results provided both attain the 17's starting place in pre-final which automatically best after Heat 28 results. The rest had to fight in 'satisfaction' drive to win the remaining 6 seats and fill the 34 places on the pre-final and final drive. Pre-final started from the 17th spot after Valters startup ranked in 13th position, but obviously lacked all, implementation speed and had to fall on the 23th place. In an effort to compensate for the speed team decided to gamble and make technique so that it is better exits of the turns, but unfortunately it turned out to be a wrong decision. After startup Valters came in 18th place but during the journey several athletes using their higher speed get in front of him. 24th place in the finals and the first phase ended with no points. After the first phase of removal of Valters father and manager Aigars Zviedris admits: " Qualification was representative 12th place from 51 rider in competition, and it was the rain - wet track. Dry slightly marred beacuse Valters os tall and the weight were a little too big. 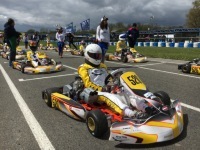 Risking a go-kart framework designed to get into the top 10, but the risk did not materialize and lost speed track in a straight line and Valters after good starts from the 17th spot fell to 23rd place in pre-finals and the 24th for the final journey. In any case, we are satisfied with the experience gained and the displayed speed. Not satisfied with the final result, but the work, both physically and with a technique to june in Portugal penetrate at least the top 10. The next stage will once again be the engine raffle. Hopefully a little of the luck in the draw. In any case, working both at the physical and at technical training in order to successfully start the next phase! " In turn, this weekend, will be Valters first starts here in Latvian - SK 333, Ropaži. Baltic and Latvian championships in the first stages. "Saturday is just one goal - victory! To start both will bring more powerful Estonian riders like Siim Leedmaa, which France won the 14th and got the test points. Georg Koss and Erich Kuhn has made notable opponents. On the domestic strongest riders definitely Matvejs Makušins ", says Aigars Zviedris. Good luck, Valters both Saturday's race here in a home track and the next CIK-FIA Karting Academy series phases in Portugal and Sweden.